This set of six, Tequila Shot Glasses would make a great addition to the home bar set and a cool gift idea. The shot glass shown is made of premium Italian glass and has a wide rim for a sophisticated look. They are perfect for tequila with plenty of room for salt and lime. Each Tequila Shot Glass is 2"W x 3.5"H with a two ounce capacity. 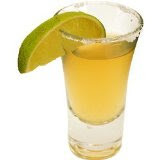 2 oz Tequila Shooter Shot Glass - Set of 6 @ Amazon.com .